Let's take a little break from the madness of last-minute shopping, and think about giving back this holiday season. There are several ways you can help make a difference in someone else's holiday, and a few can be found in or around Bryant Park. 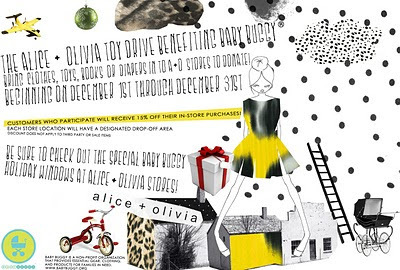 alice+olivia is located at 80 West 40th Street, right across the street from the park. If you plan on visiting Citi PondSM before the end of the year, give your closets a good clean-out before heading to the park. New York Cares is collecting gently used winter coats in two locations near the rink as part of their annual Coat Drive. You'll find collection boxes, like those pictured on the right, outside the Pond Pavilion exit doors at the southwest corner of the blue deck, and at the southeast end of the deck, between the Show Management and Pond Security offices. The collection boxes will be at the Pond through December 31. You can find New York Cares' full list of donation sites here.